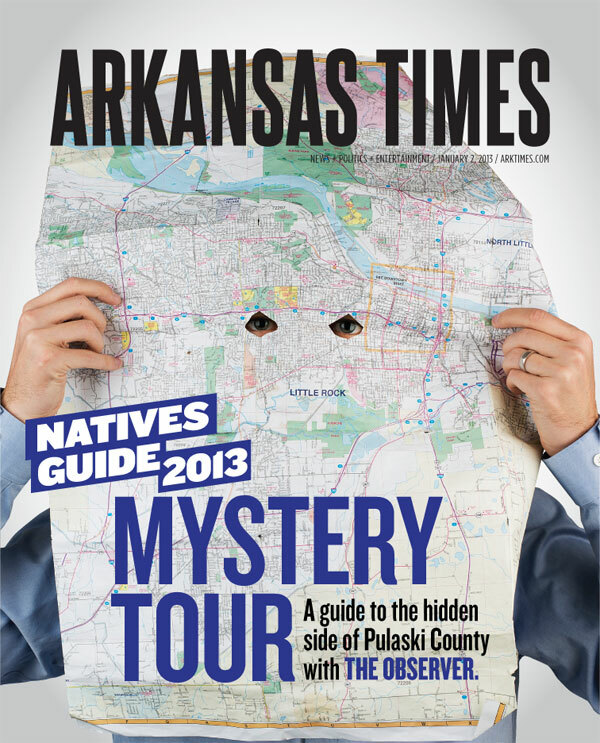 Our Jan. 2 issue was our annual Natives Guide. The only issue we do all year that breaks format and just provides some useful information to the people. The Observer is our anonymous seer of all things. 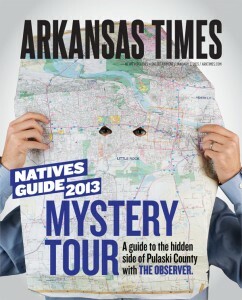 This year, he took the starring role in the Natives Guide and provided his guide to interesting and lesser-known things to see and do in Pulaski County. We threw around several ideas on how to illustrate the cover. A map being central in each idea. That somehow developed into a guy looking at a map and then transitioned to actually having The Observer, himself, hiding behind a map of Little Rock. 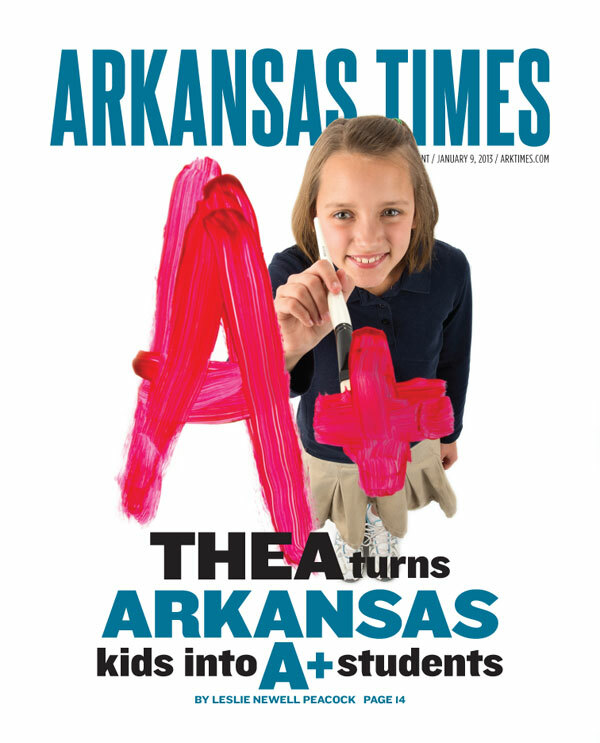 On Jan. 9, we took a look at the A+, a teaching model the THEA foundation would like to see incorporated into schools across the state. It incorporates arts into learning. Seems like a cool idea to me. I’d definitely have fared better in subjects like math if there were some creative elements incorporated into them. Seemed natural to have a school kid painting a big A+. But it took us a while to arrive to this decision. We painted up the big A+ on to a piece of plexiglass, held it in front of the model, and Brian Chilson went to work snapping away. 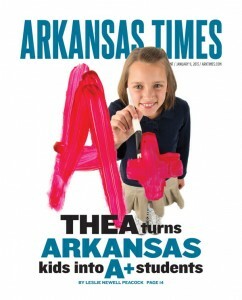 Jan. 16 brought our annual look at someone we name the Arkansan of the Year. 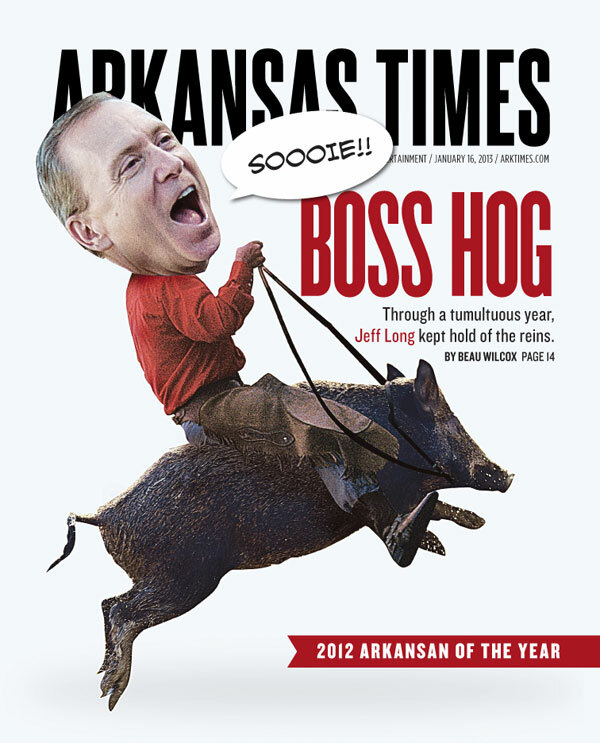 Jeff Long was the initial thought in the newsroom and received a lot of votes from folks commenting on line as well, so he was the winner. After flipping through Jeff Long photos we had at our disposal, our editor Lindsey Millar saw one in which Long was mid-laugh (I think), and thought there must be some way we could use that for a humorous cover image. He said it would be great if we could have Long riding a bucking hog. I agreed. Never did I think, I would find a photo of a leaping wild hog that would make this possible. But I did. I also pulled a stock photo of a cowboy and then went to work in Photoshop. One thing I know is true: you put a huge head on a little body, and it also brings a smile to my face. I always think these kinds of illustrations are funny and I feel like it’s almost becoming my signature photo-illustration style. Maybe one day people will be strolling through some modern art museum seeing a collection of big-head, little-body photo illustrations and they’ll say, “Well, that’s a Caddy there, no doubt about it.” Or, you know, maybe not. Environmental stories are hard to illustrate. 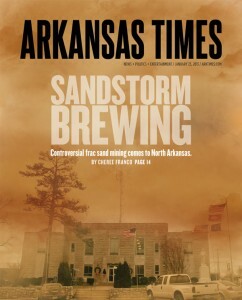 Our Jan. 23 issue’s cover story focuses on frac sand mining going on in North Arkansas. There seems to be only a small number of people in the communities affected that are concerned about the environmental impact this mining may have. We were tossing around all kinds of ideas for images involving sand and sand-related things. I had mentioned being blindsided, because as I said, it seems as though people have no idea or concern about the impact. As I scoured websites looking for some inspiration for blindsided imagery, I found some sandstorm images. I pitched the sandstorm idea. Cheree Franco had a photo of the county courthouse, and while it’s probably not real recognizable to people in the rest of the state, it’s something that represents the county affected. 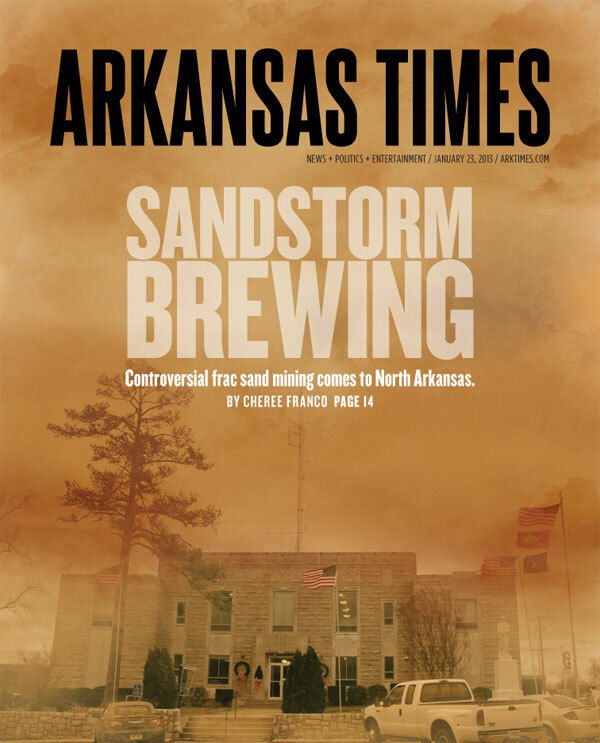 And while it may have been easy to just find a stock photo of a sandstorm in some unrecognizable place and slap a headline on it, it doesn’t really bring it home as much. Using the courthouse as the scene of the sandstorm made way more sense. So now my task was to create a sandstorm. Honestly, I had no idea where to begin. After staring at some news photos of sandstorms, I dove in playing with colors, opacities and things of that nature. The great thing about this photo is that there was already a pretty ominous cloudy sky and the wind was clearly whipping it up based on the flags. Once I was happy with the orangish look that seems very common with a sandstorm I went to work painting in some clouds. I’ve got some great looking cloud Photoshop brushes I found somewhere along the way and they were perfect for this image. They really provide a realistic look.